The medium I begin with is a hard carving wax. 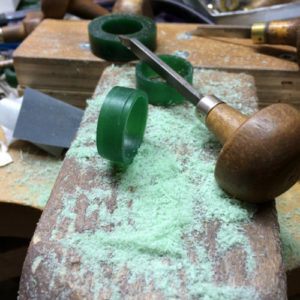 Using my jeweller’s saw with a twisted wax blade I hand cut a measured length then proceed to size the inside of the wax on a bladed ring mandrel. Creating a comfortable fit is key! 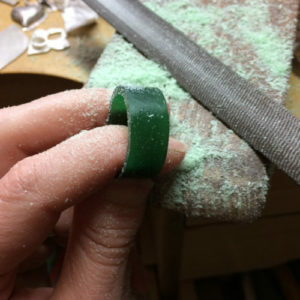 Using my calipers as my guide, I file the outside of the ring to the same thickness all around. Once I’m satisfied, and truth be told I am a perfectionist, so factor in much time, I begin to map out the texture and design. 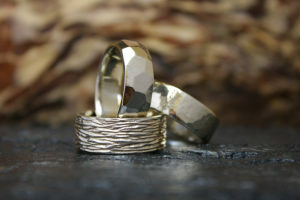 In this case I’m creating a high polish 1mm band on either side of the inner texture, separated by an engraved line. The inner portion will have a hammered texture. I use my engraver to define this line, lightly at first, then I carve deeper the second time around. 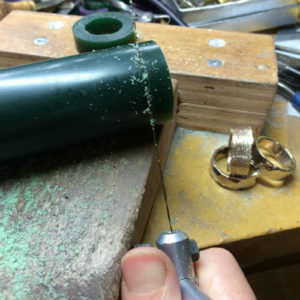 To achieve the hammered look I’m using a number of ball burrs, randomly drilled all around the band, until I have covered the whole surface of the wax ring. Finally I create a comfort fit on the inside of the band by filing or beveling the inner edge. This is the icing on the comfort cake! My band is now ready for casting! 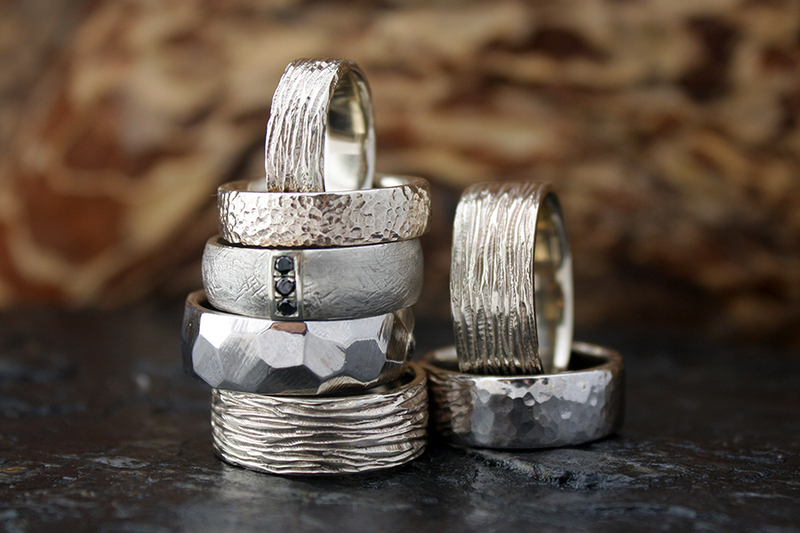 Once cast,the “sprue”, or branch where the molten metal feeds into the ring, is removed with a jeweller’s saw. Which takes me to the fun part of sanding and polishing. 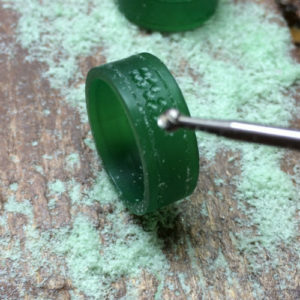 First I use a special polishing wheel on the inner texture to create a matte finish.The outer bands and inside of the ring are sanded with 400, then 600 sandpaper, then tripoli to remove any sanding lines, and finally rouge for the high shine. 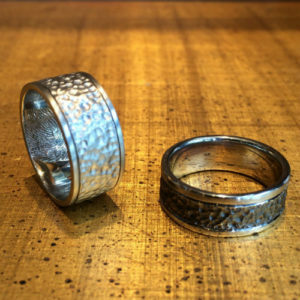 The ring on the right has the inner portion rhodium plated black, the one on the left is a matte finish with a high polish. Both rings are 14k white gold! Below is a sampling of some of my other men’s bands. 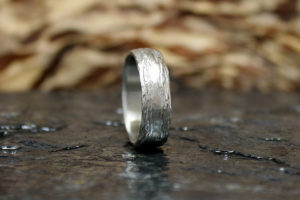 Click HERE to view my full line of hand carved men’s wedding bands. 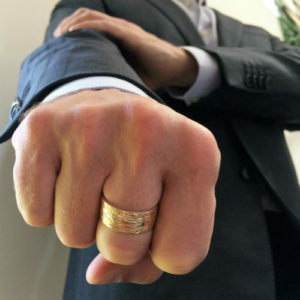 Each men’s wedding band I hand carve is custom tailored for you, from the width of the band, desired texture, and shape. 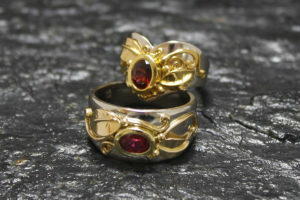 To begin the process of creating your one of a kind ring contact me HERE. It’s a fun process where I’ll ask you many questions from lifestyle to personal style, and together we will come up with the perfect design for you!